How did you find out about Clan Bell? 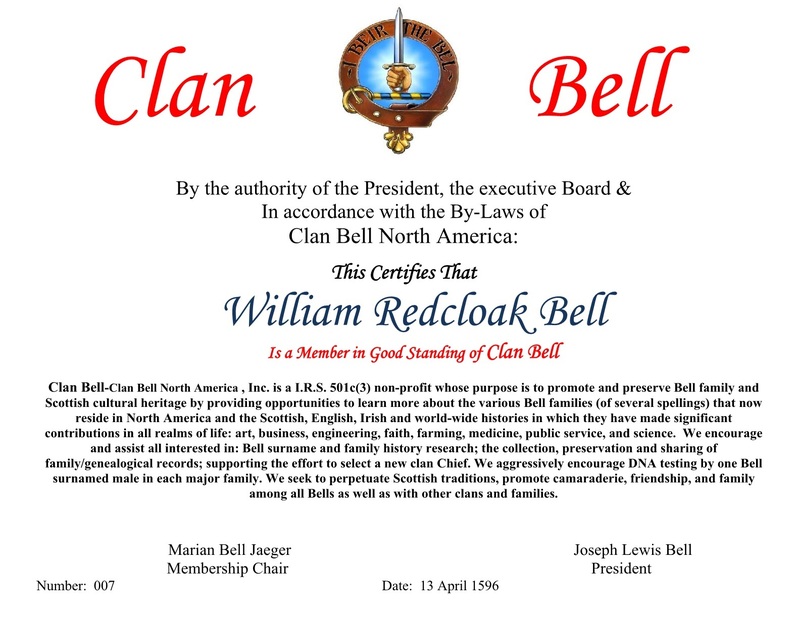 Have you been a member of Clan Bell before? Would you help with a Clan Bell tent at a Scottish festival? Is there a male Bell in your family who could do Y-DNA testing? Do you want to share information with our genealogists at FamilyTree@clanbell.org? Pressing the send button will send the data, and forward you to a new page for payment using PayPal. To apply for membership in Clan Bell North America, first complete the Application for Membership and then send the appropriate payment. The application process can be completed online. To apply online, enter your informtion in the Application for Membership as a fillable PDF, then save the form and email it as an attachment to our membership secretary at Membership@ClanBell.org. Life time membership: Free newsletter, T-shirt, lapel pin, framed certificate, decal and magnet set, a CD of "The Bells in the USA and Allied Families 1650-1977", and a print of the Bell clan badge or of Blackett House! All members also receive the Border Bells newsletter, a membership certificate suitable for framing and help support our outreach at many Scottish Games and Festivals. Céad Míle Fáilte - One Hundred Thousand Welcomes! Copyright 2015-2018 © Clan Bell North America, Inc. All rights reserved.